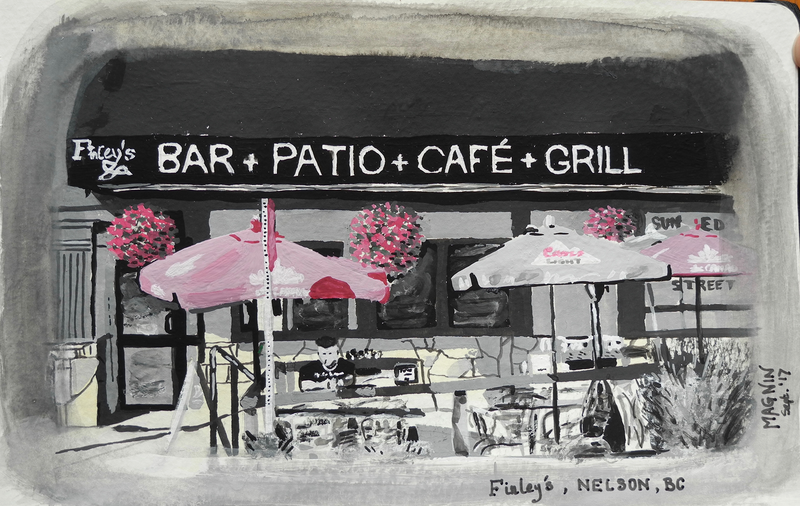 Here is another sketch of a store front I did in town (Nelson, BC) last weekend: Finley’s Bar & Grill. This is done with Winsor Newton gouache in my Moleskine watercolour sketchbook (8.25″x5″). I started on location sitting on a bench across the street but I ran out of time and had to head back home so I took a photo and finished it at home. My goal was to do the painting mostly in black and white, pushing values towards extreme darks and lights, avoiding mid-range values, and using red as a colour accent for the flowers and umbrellas at the end. More of my sketches & paintings here.